Violist Michael Hill is a native of Cleveland, Ohio. He began his viola studies at the age of seventeen and continued his education with Masao Kawasaki and Dr. Catharine Carroll earning a Bachelor of Music at the University of Cincinnati’s College-Conservatory of Music. Moving to Louisville, Michael completed a Master of Music at the University of Louisville’s School of Music with Dr. Chien-Ju Liao and Dr. Yen-Ting Wu. He was a member of the Graduate String Quartet and also served as principal viola and teaching assistant to the viola studio throughout the program. He served as principal viola for the KMEA Intercollegiate All-State Orchestra and has appeared as a guest soloist for KMEA. 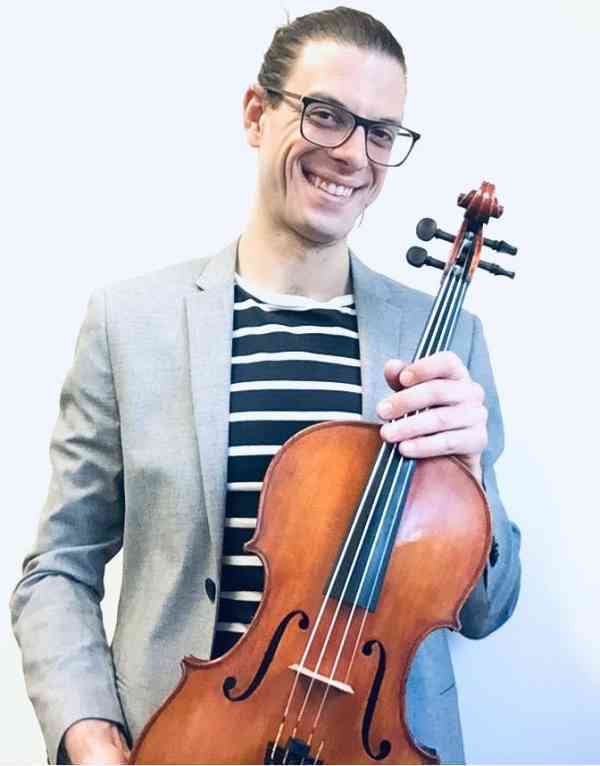 He completed a Master of Music in string pedagogy in 2016, Michael works frequently with viola students and chamber music ensembles at the University of Louisville, Western Middle School for the Arts, and the Youth Performing Arts High School. Michael has performed as an orchestral and chamber musician at the Aspen Musical Festival and School and as principal violist with the Opera Theatre and Music Festival of Lucca, Italy. He collaborates on chamber music performances, Broadway musicals, recordings, and new works by local composers. He has performed with several orchestras in Indiana, West Virginia, and Kentucky, and on Baroque viola with Bourbon Baroque, The Bloomington Bach Cantata Project, and the Indianapolis Baroque Orchestra. He is currently a member of the viola section in the Paducah Symphony Orchestra. Continuing Suzuki teacher training, Michael has completed Violin Books 1-10 through the University of Louisville through long-term form teacher training under Dr. Timothy Durbin and is working his way through the viola courses each summer under William Preucil, Sr. He teaches through the University of Louisville and is often a guest for college and pre-college masterclasses and competitions in Louisville and surrounding areas. Michael is the coordinator for the Weisberg Program, providing violin, viola, and cello instruments, lessons, and group classes influence by the Suzuki Method in local elementary schools. He is also the director of the Louisville Suzuki String Institute. With attention to ear training and technique from the very beginning, Michael’s students hold principal positions in school orchestras, performing arts schools, youth orchestras, and all- county/state orchestras. Several have continued to BM and MM degrees in music. Upholding Dr. Suzuki’s belief that Every Child Can, Michael seeks to find a way for every student of every age to find joy in making music and in their personal efforts and goals. Lessons and coaching are fun and interactive, challenging students to think critically and apply their knowledge in solving problems and developing new skills. In performing and teaching Michael seeks to share music with others through education and efforts making classical music more accessible to the public. In his spare time, he enjoys exploring the city of Louisville and spending time at home trying new vegan-friendly recipes and gardening with the help of his cat Maja.